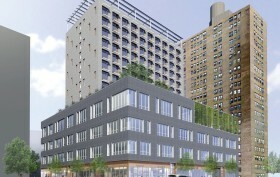 Nine months after the housing lottery launched at Dattner Architects‘ 175 Delancey Street, a 100 percent affordable building for seniors at the Lower East Side’s Essex Crossing, Mayor de Blasio has announced that the development is officially open. Not only does this mark the first opening for the nine buildings rising at the 1.9 million-square-foot mega-development, but the ceremony held earlier today included the “emotional homecoming of six New Yorkers displaced from their homes 50 years ago” when the area’s working-class tenement district was razed under a Moses-era urban renewal initiative. Since that time, debates over what to do with the vacant area raged on, with local residents and affordable housing advocates such as Frances Goldin advocating that it be used for low-income housing. To mark these efforts, and their ultimate success, 175 Delancey Street was named the Frances Goldin Senior Apartments.